It's confession time again... Hello. My name is Lucy and I am a reality show addict. ((sigh)) Yes. It's true. For the life of me, I just cannot understand why some people will subject themselves to humiliation in order to win some prize or get on TV... but as long as there are people like that in the world, I'm gonna watch 'em!!! Now that you know this, you can imagine my delight when I saw the new "Hell's Kitchen" casual game. Finally! I get a chance to test my mettle in Gordon Ramsey's kitchen without suffering the national embarrassment! Whee! Even if you are only an occasional viewer of this show, I strongly urge you to give this game a try! First of all, the graphics are AWESOME! Whoever designed this game must be a fan of The SIMS because everything has that smooth, Sims-like quality about it that really makes gameplay enjoyable. The object of the game is much like that of the show. Prepare exquisite food and try to keep your patrons happy. Easier said than done. When the game first begins, you get a little lecture from Gordo himself about what he expects from you and what he'll do if he doesn't get it. At first, I thought, "No problem!" but let me tell you; I have a whole new respect for the people who go on that show because as soon as he started berating me, I cracked! I may not be a world-class chef, but I know how to play casual games. I'd like to think I'm good at it but when Ramsey started showing disdain for my cooking timing, things went for bad to worse! As both head waiter and cook, you have to play two important roles in this game. You must first seat your tables and take their orders, then switch to the kitchen and cook it while switching back to the dining room to seat more guests, clear tables and take more orders. In homage to the show, it's all about timing. Each dish calls for a different combination of ingredients, which need to be prepared first, and a certain amount of cooking time. This game really challenges both your time management and puzzle solving skills, especially when there's more than one dish and more than one cooking time. The key is to add some ingredients but not ~all~ ingredients at specific intervals so you have time to prepare more ingredients in order to get everything to finish cooking at the exact same time. Leaving a pan on the stove too long burns it. Leaving a finished dish on a plate too long cools it. Either way, unless your timing is impeccable, you'll incur the wrath of Ramsey! Oh, and did I mention that you can only prepare each set of ingredients one at a time? Oh, and did I mention that you need to constantly check on your dining guests at the same time in order to keep them from leaving? Oh, and did I mention that as the game progresses, you'll have to seat more and more customers and cook with more and more ingredients? Yeah... I think you get my point. 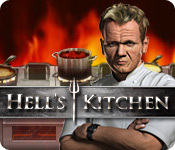 Even if you are not a fan of the show, I urge you (from a gamer's point of view) to download and play Hell's Kitchen because it is ~definitely~ one of the more challenging games out there! ... and let me tell you; just like the show, when you do it right, there's nothing better than hearing Ramsey compliment you on a job well done! Oh, and did I mention that each level unlocks an actual gourmet recipe from Ramsey's cookbook that you can print out and keep for your very own? Yeah. That little bonus makes purchasing this game MORE than worth it! Now, if you'll excuse me, I've got some ~serious~ cooking to do.